Riding a Bike in Thailand! I was standing outside the building which I would be calling ‘home’ for the next 4-6 months. Dave was standing right next to…..a Wave Honda!!!. “I am going to take you to see around”, he said. Suddenly, an image from a movie came to mind: Ben and Andy are going on their first date after meeting at the bar, and he points to his choice of transportation: a bike, and says to Andy: ‘Are you ready to go for a ride Andy?’…..to which Andy replies with the same question, different intonation: ‘Are YOU ready to go for a ride Ben’? (How to Lose a Guy in 10 days) Hahahahah….Was I ready to go for a ride? Me? get on that, for real? How was I suppose to hang on to my seat-cane and still hang on to the rider for safety? I was not an octopus! And CIPN isn’t exactly movement and balance friendly. But adventure was part of the deal and after putting on a helmet, securing my seat-cane with a bungee cord to my waist, and wrestling with my legs finding a spot where they could rest with the least amount of pain and finding a decent balance I was able to get on the back of the bike. Dave took off and I hung on to him for dear life!!! The experience was great; I am not so sure Dave’s waist agreed though…I was hanging on hard! 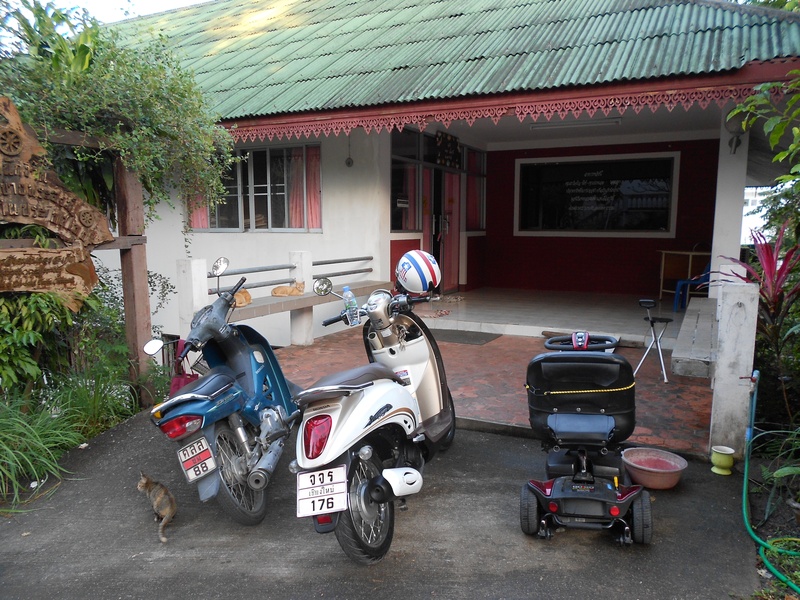 We went to look around Wat Doi Saket, to the fish pond, and to the Dam. What a wonderful ride that was! Here is a picture of the Dam we went to see. While riding with Dave that first time I remembered the Elite Honda I used to own, a gift from my brother Emilio. I loved riding it; I even rode it to the school where I used to work. When I told this to Dave he insisted I gave it a try, not on his, but on Natch’s which was a Scoopy, an automatic, much easier than Dave’s. I did. I was terrified and thrilled at the same time. Between my balance issues due to the neuropathy and my forgotten experience I wobbled but I did it and it felt amazing! A few weeks later I saw myself searching for a bike! You ought to see the amount of bike markets and stores, used and new, it was a bit overwhelming making a decision. I opted to rent one first and to see how I did with it. I chose one that was not too high for my legs and not too heavy. The fish pond was the witness to my first lesson. Going around the pond, trying out the brakes, always knowing Dave was walking around in case anything happened. He was so nice, patient, understanding and encouraging. Soon, my previous knowledge came rushing back and slowly my confidence grew stronger. However, on the way back to the Wat I learned my first hard lesson; scared to ride it up the hill, I stopped and turned right in the middle of the ascent; long story short, the bike tilted to the side, I tried hard to hold the bike and kind of succeeded but it was scary and difficult! I had bruises in both arms for days! 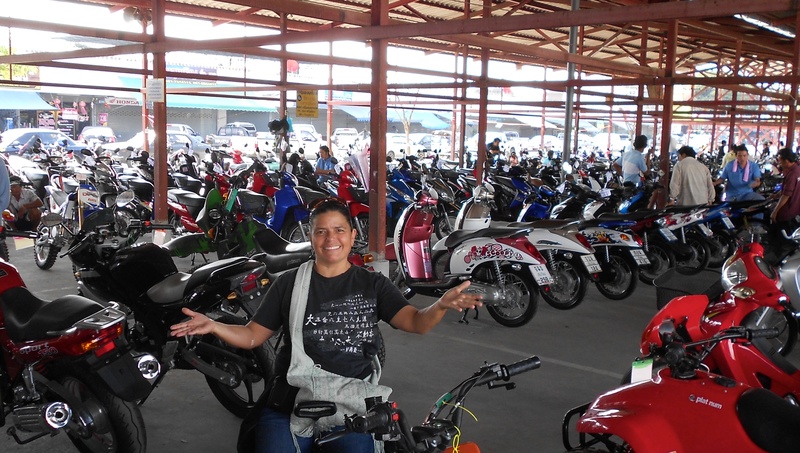 It is not hard to see that Thailand is definitely a motorbike country! I have to say that maybe 75-80% of the population drives a motorcy. Back home one could see a few motorcycles, mainly Harleys and Hondas but nothing like here. I have seen such a variety of bikes, it is unbelievable! Yamaha and Honda are the most popular but there are others as well. I was in shock when I saw the first PINK bike, so lady like, it made them look so easy to drive! Yes, they come in all different colors and styles: blue, orange, yellow, light-blue, purple, red…automatic, non-automatic….Fino, Mio, Amore, Scoopy, Wave, Dream….you name it. When I first planned on volunteering I pictured the Monastery to be out in the wild with no paved streets, but this one does have paved streets and it is right next to a small town which makes it perfect for having a bike. I feel very lucky to have chosen this program amongst many others. Dave is great and is always there to help and make my stay a memorable one. I have slowly gone from ‘holding on for dear life’ to ‘lifting both arms and happily feel the wind on my face’; no more bungee cord for my seat-cane or holding on tight, my middle section has gotten the ‘feel’ of riding the bike and now I can take a picture ,drink a cup of coffee…..even carry a big laundry bag on my lap!! Hahahaha I know, crazy, hugh? 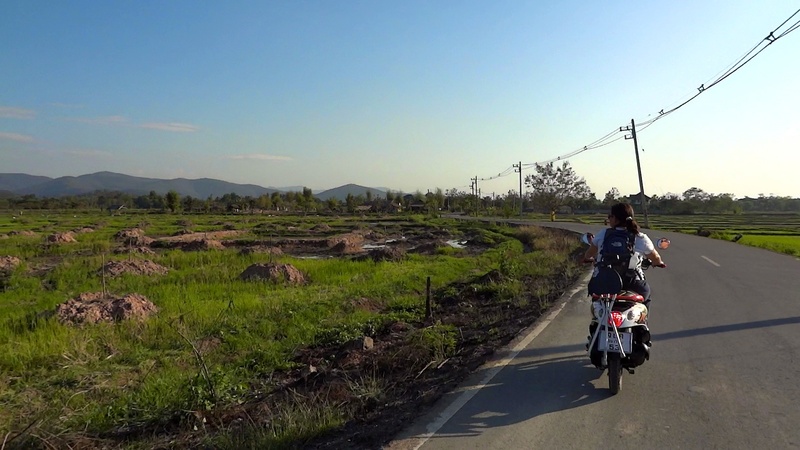 but you have got to see what Thai people are able to do and carry on the bikes. I have seen: young girls all dressed up and wearing high hills; family of 3-5 on one bike; kids fast asleep on the back of the parent driving; animals balancing on their own in front of the bike with two paws on the seat and the other two on the handle; girls seating side-ways on the back texting, unworried. Some bikes even have an extra front seat, specially installed for kids. Bike hunting was fun and exhausting and I had mixed feelings: excitement and terror! But excitement won and thanks to my brother’s generosity I now have my own bike, an orange Yamaha Fino. I am blessed with the opportunity of being here. Dave and I have been exploring the area, riding on the back roads, learning about Thai culture, enjoying the views, visiting markets, fairs, festivals, schools, Wats, parks, making new friends…riding along happily….and when we least expect it after a turn on the road, the universe has a peaceful sunset over the mountains reflecting the sunlight on the rice fields…a perfect way to wind up long riding days. Riding a bike here in Thailand has been exhilarating! The sense of freedom, the sun hitting my skin, the music of the wind singing in my years, the song in my heart, and an unvoiced, sometimes voiced, energizing shout in my lips…..After a few days of having my own bike, Dave asked me: “have you sung already while riding your bike?” I laughed so much because that was exactly the way I felt! Feelings are universal, after all. I am well, although I will have a third surgery on Thursday, April 26 at 11:15am to remove the same single tumor that will not leave my brain. Please pray to the Budda, Christian, god for me. I am so very dellighted to be reading your Blog. You are incredibily courageous and an inspiration to me. Thank you my friend! You are an inspiration to me, my dear LInda! Hope life is being good to you! How are you? Thanks for stopping by!! Thanks for sharing Marcia. Sharing your journey, sharing the hiidden Celedon pottery factory, and the Umbrella Factoriy. I look forward to the reading the other posts. HI Doug!! They were real fun days! Thank you also! Next time we can go to de Dam Hope to see you back here again! Take care.